5 points if you can guess what happened. Hint: the problem is the thing on the right. Bonus 5 points if you can guess what I did with the rope. Hint: this quote from the Pirates of the Caribbean comes to mind: "This is either madness or brilliant..." "It's remarkable how often those two traits coincide." Are you still alive....hello TASKSWAP, are you okay? Ding ding ding, Bansil takes this one. You win 10 points! Points are redeemable for snarky comments, useless trivia, and free advice. Cash value $0.0001. I had a very lucky day yesterday - if you can count disasters as lucky. I had a bearing seize on my trailer, which is super dangerous because the OUTER bearing is pretty much the only thing holding the wheel on. I'm calling it lucky because it was the inner bearing that went, and I pay real close attention to my loads while towing so I caught it almost instantly. The axle is in pretty good shape, considering. It was hot to the touch when I pulled over but not too hot to hold my hand on so I figure it was mid-100s and I probably didn't anneal it. Its surface isn't terrible either. The hub is also usable, at least for now. 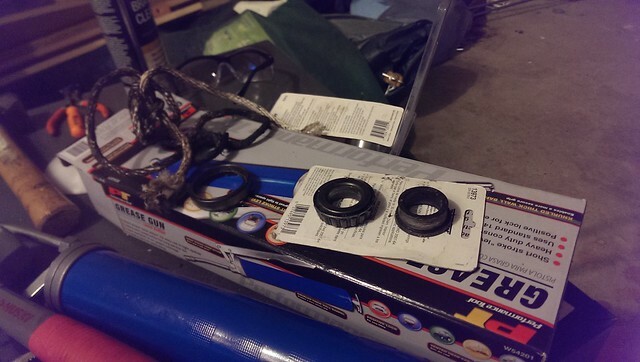 Unfortunately the auto parts store didn't have a perfect match for the bearing kit - the bearing is fine but the rear oil seal is only a partial match. Given all this, I'm going to risk another trip or two and keep a super close eye on it. I don't really have a choice - we have to be out of here in a week. Then I'll put a replacement axle kit on it. They don't cost much more than the parts to replace the hubs and bearings and then I'll know it's good to go for another long while. This trailer is 12 years old and I got it for $100, so I figure I'm still ahead of the game! I will see your frozen bearing and raise you a broken coupler with an Excursion riding on the trailer. I think that's even better than the shredded tire. Yikes! I hope it 's all working out for you Crazycal. Ouch! Yeah, can't fix that with rope. What'd you end up doing? Spent the night in a town I didn't want to waiting for businesses to open. No place had the right coupler. Had to shift the coupler to put more weight on the tongue and limp to Amarillo. Shredded a back tire on the way. Another fiasco. Finally got what I needed from Hawkins Trailer in Amarillo. Now that is a trailer store. They had everything. This trip has been a complete disaster. Let this be a lesson children, inspect your equipment thoroughly before any trip. I thought I inspected the trail up and down. I suspect the coupler was damaged before I left on my trip but don't know for certain.